Now, THIS is a big episode, Buffy the Vampire Slayer fans. Buffy the Vampire Slayer Season 1 Episode 7 is the catalyst for so much backstory that will come later on in the Whedonverse. As I've mentioned before, Buffy the Vampire Slayer Season 1 is mixed with strong episodes and considerably weaker entries. "Angel" is definitely one of the former! This is an hour any Buffy the Vampire Slayer fan (and Angel fan) needs to watch. With that being said, let's rewatch "Angel"! 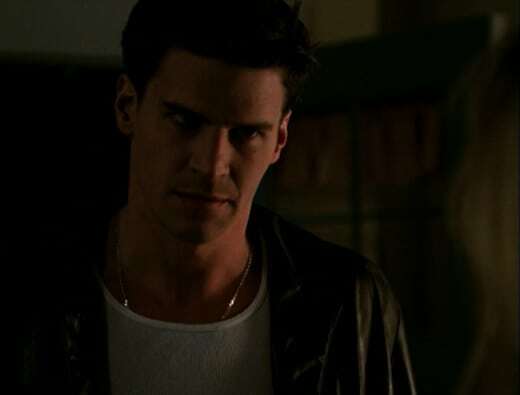 Buffy was right to worry about Angel and his sketchy tendencies. He was giving off major uninterested red flags. It's obvious to everyone and their puppy she's crushing on him. However, he keeps popping in and out of her life with only danger warnings. That's not the base to start a relationship. She got nothing from him before "Angel" except for longing looks. Why did The Master wait all this time to send The Three? Buffy has consistently been a thorn in his side. She is never not killing his followers. I mean, she stopped him from ascending during The Harvest on Buffy the Vampire Slayer Season 1 Episode 2. If he truly wanted to rise, why didn't he have The Three protect the club when Luke was feeding? Why didn't they attack sooner? It's a strange plot hole to make us believe these three highly-trained enemies were sitting in wait all this time until now. Rupert: It seems you encountered “The Three”. Warrior vampires, very proud and very strong. Rupert: Well, you weren't here from midnight until six researching it. Permalink: It seems you encountered “The Three”. Speaking of The Three, their reputation was blown so out of proportion. What did they even do?! Nothing. 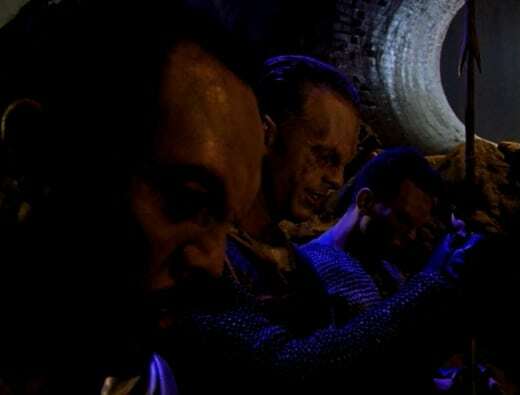 If The Master really wanted to kill Buffy, he could've pardoned The Three to go after her the next night. He killed his fiercest warriors because of one botched attempt. With that logic, Darla and most of his followers should be dead. That's poor leadership. Even though Angel is...Angel (the words "brooding" and "handsome" come to mind), he shouldn't have gone shirtless and later made out with Buffy in her room. I keep forgetting Angel is somewhere in his early twenties while Buffy...she's like 15/16 by Buffy the Vampire Slayer Season 1 Episode 7. Angel is being a creeper here. He's actually going after a high schooler. Joyce may have thought he was a college student, but her parental instincts were right. Willow and Buffy were really impressed Angel tried nothing when he slept in her room. Like, REALLY happy. I may be jaded from dating nowadays, but it takes more than not trying something to be a gentleman. Where has Cordelia gone? There's been a serious lack of the queen bee. I missed her sass on Buffy the Vampire Slayer Season 1 Episode 6. She would've added a bit of flair. At least we were treated to a few memorable one-liners. Xander: You're in love with a vampire? What are you outta your mind?! Xander: Not vampire. How could you love an umpire? Everyone hates them! Cordelia: Where did you get that dress?! Cordelia Chase: This is a one-of-a-kind Todd Oldham. Do you know how much this dress cost? Is this a knockoff? This is a knockoff, isn't it? Some cheesy knockoff! This is exactly what happens when you sign these free trade agreements! Buffy: Think we have problems? Permalink: You're in love with a vampire? What are you outta your mind?! Darla, and especially Julie Benz who portrays her, is perfection. She controls every scene she's in and owns the moment. She is hands-down one of my favorite characters. We only got bits and pieces before of Darla's screen time on Buffy the Vampire Slayer. However, "Angel" gave her a spotlight and backstory. Just like I mentioned for the rewatch of Buffy the Vampire Slayer Season 1 Episode 1, who knew Darla would be so important later on? Darla and Angel have great chemistry together. Even though this is the first they're interacting during Buffy the Vampire Slayer Season 1, you can tell they have a history. The tension is thick. I loved when she was toying with him. It's almost like a "spider to the fly" moment when they talked. Darla is possibly the only person who knows how to get under his skin. For the keen Buffy fans, this is the first time someone mentioned Angel's curse. Darla doesn't go into detail here, but we're introduced to the concept. This throwaway line will play a bigger part later on. Angel: Maybe you don’t want to be. Darla: I’m not afraid of you. I bet she is though. Maybe I’m underestimating her? Talk to her, tell her about the curse. Maybe she’ll come around? And if she still doesn’t trust you, you’ll know where I’ll be. Permalink: You and I both know what you hunger for...what you need. Angel and Buffy kissed! Shippers, this is your moment. Congrats! Before their kiss, it was obvious Buffy had a thing for him, and vice versa. I figured this would be coming eventually. However, they never had a strong relationship development before their lip lock. The closest we got to Angel making a move on Buffy was him giving her his coat on Buffy the Vampire Slayer Season 1 Episode 6. She had a crush, but they developed quickly toward having chemistry. How did Buffy not know Angel was a vampire? Seriously?! It was obvious. She only ever saw him at night or in the shadows. He never gave details about his life. And, furthermore, he knew too much about her enemies. You know, the vampires. Buffy has shown to have instincts pointing out vampires. I don't get why her senses were blind to Angel. Let's make this known that Darla is an intelligent person. She's done something most vampires have never been able to do: she got into Buffy's home. Pretending to be a fellow student and tricking Joyce was a subtle move I'm surprised others have yet to try. She almost got close to killing Joyce, and she would've done it if she had not used it to frame Angel. That takes planning and resourcefulness. Fun fact: "Angel" is only one of two episodes were a gun was used to try and kill Buffy. It's surprising to think about, especially since it seems like an obvious method. Buffy is mortal, and guns hurt mortals. It's really that simple. Darla isn't reinventing the wheel here, but she's the only one who actually tried. I'm happy this mechanic wasn't used much beyond "Angel". Buffy is a strong character and it's more interesting to see her fight her enemies with her strength and ingenuity instead of trying to divert guns. Buffy: You guys were involved? Buffy: Well, you’ve been around since Columbus, you are bound to pile up a few exes. You’re older than him, right? Between us girls, you’re looking a little worn around the eyes. Permalink: Do you know what the saddest thing in the world is? Did anyone foresee Darla being Angel's sire? When I had originally watched Buffy the Vampire Slayer Season 1 Episode 7 back in 1997, I never made this connection. There was no inclination they knew each other. It came from left field. However, I'm glad the writer's made this connection to the characters. Darla and Angel's backstory is heartbreaking. She loves him and, while I think he does care for him, he doesn't love her back. And seeing Angel fawn over Buffy must've hurt Darla so much. Angel killing Darla is an important scene to both the Buffy the Vampire Slayer and Angel series. Killing Darla not only showed he loved Buffy enough to kill his sire, but he made a conscious effort to eliminate an important part of his past. It strengthened their bond. Darla: Hi, it’s been a while. Darla: Or two. But who’s counting? Angel: What’s with the Catholic school girl look? Last time I saw you was kimonos. Darla: And the last time I saw you wasn’t high school girls. For a second, I had thought their second kiss was a kiss goodbye. It was like she was giving him the kiss off. Though, we know better than that. Buffy and Angel aren't giving up easily. Everything about the slow dance, their light conversation, and the burning of the cross on his chest made the scene. This moment was perfection. What did you think of "Angel"? How did Buffy not realize Angel was a vampire for so long? Is Darla simply perfection?